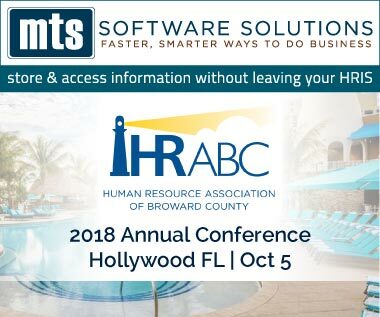 Join hundreds of human resource professionals at the Margaritaville Hollywood Beach Resort for the 2018 HR Association of Broward County Annual Conference (HRABC). Stop by the MTS Software Solutions table to meet our Solutions Consultants and learn more about how we can solve your HR paper problems, giving you the ability to store and access information without leaving your HRIS. We offer document scanning services to digitize and gain easy access to the information on your paper personnel files. We also offer automation solutions to streamline HR processes and transform employee services levels.